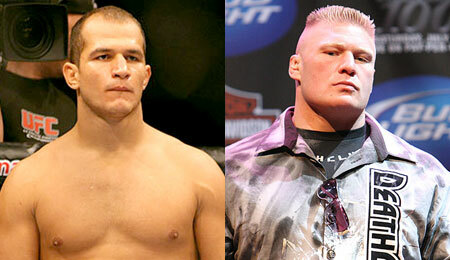 With filming set to begin next week for the 13th season of “The Ultimate Fighter,” Junior Dos Santos has started to select his coaching staff to go head-to-head with Brock Lesnar on the reality show. The Brazilian heavyweight has a who’s who list of potential trainers to bring with him. He has already chosen a couple of top coaches to assist him when the show starts. “He’s got quite a few different guys. His main coach is gonna be the main coach (on the show), Luiz Dorea, who is Anderson’s boxing coach, Junior’s boxing coach, Rodrigo Nogueira and Rogerio Nogueira’s boxing coach. He coaches the Brazilian national team. That’s gonna be one of the boxing coaches,” Ed Soares, Dos Santos’ manager told MMAWeekly Radio. In addition to Dorea, Dos Santos will bring in another stand-up coach to work with his team. “We’ve got Billy Scheibe, who lives down in Oceanside. He trains Junior in Muay Thai. He trains Brandon Vera. He trains Nogueira. He’s going to be one of the coaches. And there are some other guys we’re working on,” Soares revealed. One plan that may come into effect later in the season are guest coaches that could assist Dos Santos along the way. Names like Anderson Silva, Antonio Rodrigo Nogueira, and many other top fighters who train at Blackhouse MMA alongside Dos Santos on a daily basis could find their way onto the show. Dos Santos will travel to Las Vegas next week to begin his six-week stint on the show coaching a team of welterweight fighters, before heading back into training himself for a June showdown against Lesnar. The two are likely to square off at UFC 131 in Vancouver.